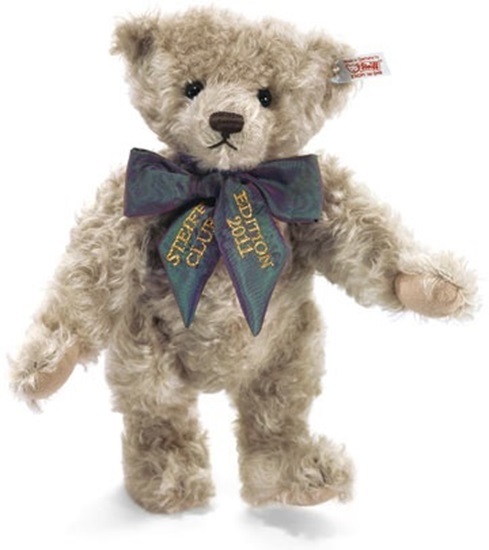 Designed specifically for Steiff Club members, this teddy bear was the annual teddy bear for 2011..
Reminiscent of the little of bears from the 1920's., this sweet teddy bear is the 2011 annual teddy for Steiff club members. He's made from curly antique golden mohair and wears a truly special bow that's almost iridescent with its blue and purple sheen. Naturally, as with all annual editions, the 2011 version's bow is embroidered with glittering metallic thread. He is 5 way jointed with black safety eyes and a hand stitched nose and mouth. He comes with the white tag "Button in Ear".